Strawberry picking season is almost here for us in the midwest! I'm anxious to get back in the strawberry fields to pick some fresh berries this year. I've made some room in my freezer so I can quick freeze some berries to help last in the coming months but I know a little someone who would rather eat them as is. Luckily, I was able to make this Strawberry Key Lime Tart before my strawberry eating machine had a chance to eat up all the fresh berries and it was perfect to welcome the strawberry season coming up. 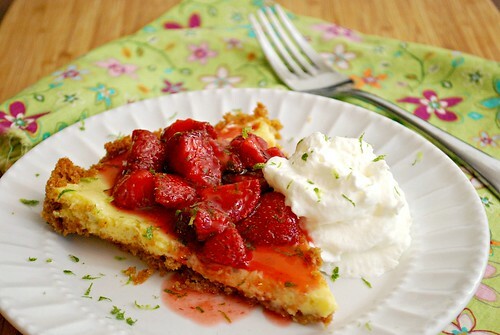 Strawberries and key lime come together in this tart in which a key lime filling is set in a graham cracker crust, followed by a layer of strawberries and served with a key lime whipped cream... summer's calling and it's on the plate! This recipe is a combination of recipes from Cook's Illustrated. I mashed up their Key Lime Pie recipe and Strawberry Pie recipe to create this summer ready dessert! Strawberries and lime are a wonderful combo that just screams summer and it's a great way to welcome the season.The directions may seem a bit much with the four different tasks but don't let it stop you. You can also make this in stages or in advance! For the Filling: Whisk zest and yolks in medium bowl until tinted light green, about 2 minutes. Beat in milk, then juice; set aside at room temperature to thicken. For the Crust: Adjust oven rack to center position and heat oven to 325 degrees. Mix crumbs and sugar in medium bowl. Add butter; stir with fork until well blended. Pour mixture into 9-inch pie pan; press crumbs over bottom and up sides of pan to form even crust. Bake until lightly browned and fragrant, about 15 minutes. Transfer pan to wire rack; cool to room temperature, about 20 minutes. For the strawberry layer: Toss berries, sugar, and salt in medium bowl; let stand until berries have released juice and sugar has dissolved, about 30 minutes, tossing occasionally to combine. Place jam in small saucepan. Bring jam to simmer over medium-high heat; simmer, stirring frequently, until dark and no longer frothy, about 3 minutes. Stir in lemon juice; pour warm liquid over strawberries and stir to combine. Let cool, then cover with plastic wrap and refrigerate until cold, at least 2 hours or up to 12 hours. To finish tart: Remove the baked tart from the fridge and spread a layer of strawberry topping on top. Garnish with whipped cream topping below. For the Whipped Cream: Up to 2 hours before serving, whip cream in medium bowl to very soft peaks with electric mixer or wire whisk. Adding confectioners’ sugar 1 tablespoon at a time, continue whipping to just-stiff peaks. Stir in lime juice and zest. Decoratively pipe whipped cream over filling or spread evenly with rubber spatula.